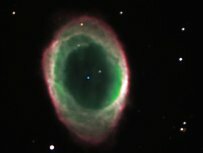 Ring Nebula (M57) imaged by the LT in 2003. July 21st 2008 saw the fifth anniversary of "first light" at the LT, when on-site telescope assembly was complete and the first ever LT image of a celestial object was obtained. Since that time, the LT has taken half a million images as part of 183 separate research proposals led by 82 separate principal investigators, administered through five telescope allocation committees. These news items and more are available in the News Archive.